Indotechboy — Are you a gaming freak? Anywhere you want, anytime you want, you always want to play game. Whether in your Android, smartphones, or your PC? If you very like to play game on your mobile devices such as Android or iOS smartphones and tablet, then maybe someday you will say "Grhhh... dammit, you touch screen!!!" when you lose your game . Then one thing you must have to maximize your mobile gaming experince is a gamepad or controller. Whether your choice can be different controller devices such as PS3 dual shock if your device is support for USB OTG, or an easy bluetooth gamepad controller such as MOGA or IPEGA that work on every bluetooth device. And my first ever controller is the bluetooth controller IPEGA PG-9021. 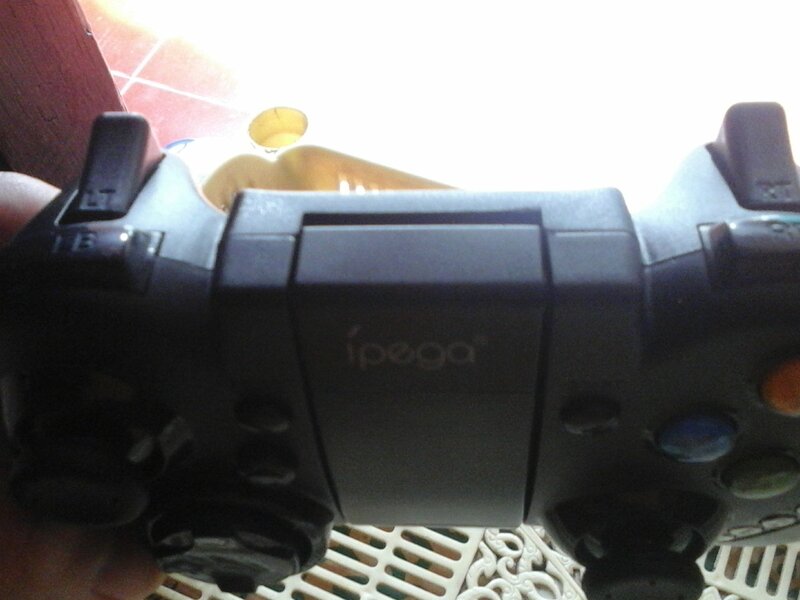 I bought IPEGA PG-9021 because the price is cheap and affordable on my pocket :D :v . I got it only for +- Rp. 200.000 IDR or equal to less than $20 USD. It is made in China tought. For such as the cheap bluetooth gamepad controller, I am very satisfied with its design and performance. I have tested it on my Samsung Galaxy V Android smartphone and IPEGA PG-9021 is working very well without need to setting anymore on every game emulators such as PPSSPP, ePSXe, My Boy! etc. It also run very well on every game that MOGA supported Android game I have tested such as GTA San Andreas, Crisis Action, SBK 16, etc. If your Android phone is running Android 3.2 above, then you are done, every Android game and emulators that MOGA supported is can be played directly without need of any setting / config using Gamepad Mode. However if your phone is running Android 3.2 below, you can use Keyboard Mode and it looks like it can only be played on game emulators and also you need to remap the button first. IPEGA PG-9021 is compatible with my Advan Vanbook W80 Windows 8.1 PC tablet. Well as far 'till now, I just had use it to play game in various emulator programs such as PPSSPP, ePSXe, DeSmuMe, etc. The only PC game I have played using IPEGA PG-9021 is only Fairy Tale Freesia until now. The mouse mode is also very helpful. I don't need to spend any money if I want to use a mouse on my Advan Vanbook W80 PC tablet :D .
IPEGA PG-9021 gamepad is also compatible on iOS device running iOS 4.3 above on iCADE mode and only support on games that support on iCADE mode, as iOS or iPhone is very restrict the bluetooth connection. I haven't try it yet, 'cause I don't have an iOS or iPhone (yet) :v .
The Bluetooth 3.0 used in this gamepad is made it can reach range up to 8 meters from the connected device. The design is cool. It is shaped like the MOGA PRO gamepad, and the size is a little bigger than Playstation dualshock controller. The button and the analog is good and pleasant for me. I just don't like the directional button, it is just a little hard to be pressed, but it's not a big problem as we will often use analog rather than directional button when we play games. The telescopic stand is supported for device or phone up to 6 inch range. This gamepad is powered by 500mAH battery, you can charge it for 1 hour to full the battery capacity and it can be used up to 16 hours (depend on what game and how brutal you play :D). 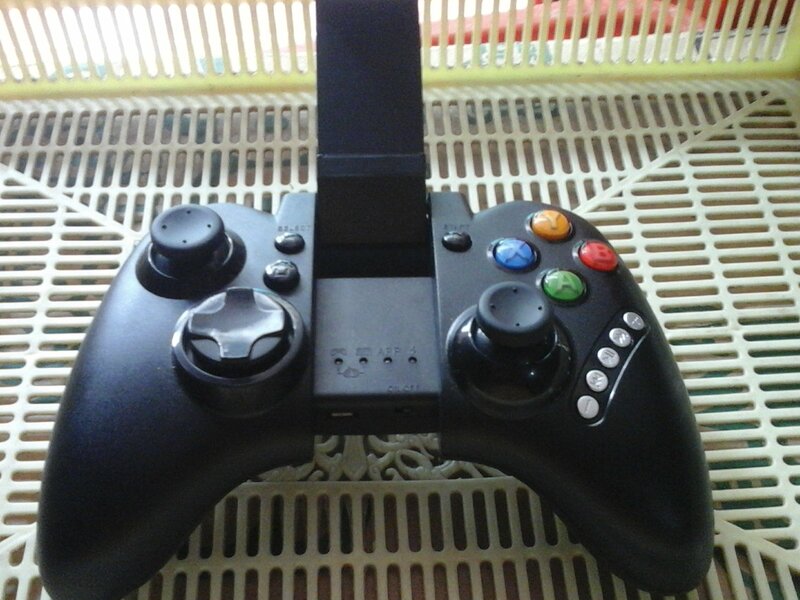 Gamepad X + HOME Android 3.2 and above, Windows 8 and above. Used to play in MOGA / bluetooth controller ready Android games and emulators. Button remapping in game or application is not necessary / May need button remapping in some Windows or PC games. Keyboard A + HOME Android 3.2 and below. It's serve as the replacement of gamepad mode as gamepad mode is not supported in Android 3.2 and below. Most only useful for used in emulators application like PPSSPP, ePSXe, Drastic, etc. You can try this mode if gamepad mode is not working well with your Android device. Need button remapping in the application first. Icade B + HOME iOS 4.3 and above. Used to play game in Icade ready iOS games. Mouse Connect using gamepad mode. After connected with your device, then press Y + HOME. Android 3.2 and above, Windows 8 and above. Use your IPEGA PG-9021 as a mouse. Use right analog stick for moving pointer, LB button for left click and RB button for right click, d-pad left and d-pad right for moving scroll. Overview, this gamepad controller is great. It is cheap, yet nice and functional. A must try if you want to taste how a bluetooth gamepad / controller with your smartphones, tablets, or computers while saving more of your money. Comments (0) in "IPEGA PG-9021 Review - The Standard Affordable Bluetooth Gamepad"